It seems everyone wants to live their life to a personal music soundtrack these days. I was standing at the top of Mt. Kaukau last week listening to the birds chirping when a fellow tramper walked past, iPod phones firmly planted in his ears. As we ride the bus to work, exercise, do our housework, portable music players are our ever-present companions, buoying our spirits with carefully selected mood music. The advent of "podcasting" where radio shows, talking books and public discussions are being converted to mp3 files and posted on the internet has extended the trend beyond music. At least one family member will be nagging you for a music player this Christmas. Choose carefully which one you go with as you’ll shell out anywhere from $200 - $700 for one of these gadgets. The music player world is dominated by Apple’s iPod which has around 70 per cent of the market. A range of other manufacturers are scrambling to take the crown from Apple and while there are some good products on the market from the likes of iRiver, Creative and Toshiba, no "iPod-killer" has so far emerged. The iPod’s success lies in its simplicity. It lets you play music and video where you want and using the accompanying iTunes software, makes loading up the device with your favourite content a breeze. Even the techno illiterate can use an iPod. But there are music players out there with more features – such as built-in voice recorder and FM radio tuner and that function better in the Windows environment most of us are used to. The iPod doesn’t support the wma (Windows Media Audio) file format which many people have converted their music files to. Music download services such as Coketunes and Digirama are in the wma camp so getting downloaded files to play on your iPod is difficult. Rumours persist that Apple’s online music store iTunes will launch here in January which would open up a world of possibility for iPod owners. Australia finally gained access to iTunes in October and Apple has a strategy of opening the stores wherever it sells the iPod so a launch for New Zealand can’t be far off. If you want a music player to listen to while you work out at the gym or jog, make sure you get a "flash" memory based music player. Unlike the larger capacity hard-drive based players, flash devices have no moving parts and handle bumps and vibrations better. Also consider getting one that has an arm band or belt holster as an accessory. You don’t want your music player bouncing around in your pocket. Keep in mind that battery life estimates wont take into account regular use of the LCD screen which chews a lot of power. The idea is to get a music player with enough playlist, shuffle and random playing options that you don’t have to keep delving into the menu. Looking for a player with a stated battery life of 14 – 20 hours. Be realistic about what you need in a music player. Will you really watch video on it or use the voice recorder. You may find you just want to play music. In flash players don’t settle for less than 2GB (gigabytes of storage) while 20GB should be the minimum for full-size players. Not only is it the hottest gadget of the year full stop, the iPod Nano showed the world that a small, lightweight music player can be a fashion accessory as well. Replacing the aluminum-encased iPod Mini, the Nano shifts from hard drive storage to "flash" memory allowing it to be much smaller and use less battery power. 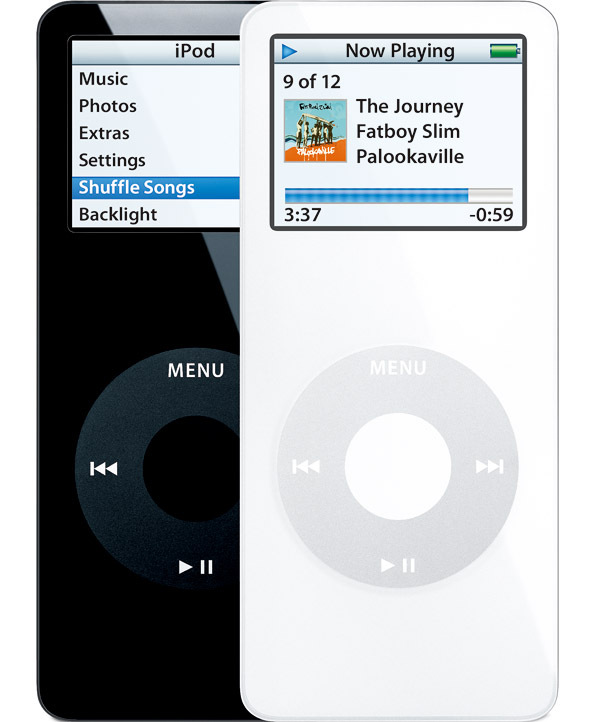 While capable of carrying less songs, the tiny Nano maintains all the functionality of the full-size iPod (except video playback) and has a crisp, colour screen. Its release around the world has been marred by the fact that the screens on many Nanos broke or scratched easily. Did Apple go too small, too thin? Well-looked after and stored in a carry pouch the Nano won’t damage easily. The format has a lot of mileage in it yet. Anything Toshiba makes has the mark of quality and so it is too with the Gigabeat, its rival to the full-sized iPod. For those firmly in the Windows camp it works seamlessly with Media Player 10 and the music download sites so far available here. A solid, brushed-steel body is broken only to accommodate a large colour screen. A big plus-shaped control pad on the front of the Gigabeat doesn’t have the smooth, touch-sensitive quality of the iPod’s scroll wheel but allows easy navigation through the Gigabeat’s menu. Placed on its cradle the Gigabeat syncs easily with your computer and when plugged in directly via a USB cable functions as a hard drive for storing files. There’s a photo viewer as well. The Gigabeat isn’t perfect but it does show Toshiba is serious about the portable music player market. Don’t write off this Korean gadget maker just because you’ve never heard the name. The compact X5 is a powerful little device that works independently of proprietary software to give you quick access if you just want to transfer songs across. It supports a good range of file formats and was allowing video play back on its colour screen well before the video iPod appeared. It’s also an FM tuner and voice recorder as well and comes with a leather case. A small, metal jog dial gives access to the X5’s fairly simple menu. While more functional that the iPod, the X5 will really have to come down in price to compete with the king of music players. Keep an eye out for one on special. Samsung’s range of flash-based portable music players are ideal for lovers of the great outdoors. They come wrapped in a rubber condom which protects the buttons from moisture and gives the small player a ruggedised look. It has a colour screen about the same size as that on the average mobile phone and serves several functions – music and video play back, FM radio, line-in recording and voice recording. The video function is surprisingly good for such a device that weighs just 55 grams and battery life was impressive (up to 20 hours). The memory has enough capacity to hold 400 songs. The Nano impressed with revolutionary design but the reigning champion in music players is the full-sized video iPod released a couple of months ago. It updated the traditional iPod to allow video to be played back on its screen. Overseas, iPod owners can download Desperate Housewives to their iPod through iTunes. 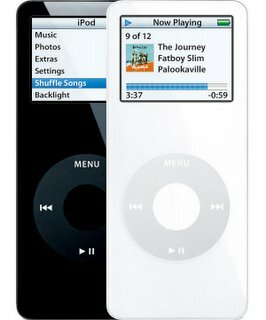 We don’t enjoy such luxury yet, but for your own video clips or movies downloaded via the internet, the iPod makes a capable and watchable video player. The 30GB version is also capable of holding up to 7000 songs – probably your entire music collection. For Mac users it’s a must and even Windows users will appreciate the simplicity of the iPod-iTunes combination. Burning them to CD and then ripping them as MP3 or AAC files is difficult? Blimey! Also, I think you've been fooled by some comment spam. I liked your information in MUSICAL PRESENTS: MP3 PLAYERS FOR CHRISTMAS. Too bad it doesn't have more on car battery. I was looking for car battery in my area. Enjoyed reading what you have. I'll check back later when I get some spare time next week. Thanks PETER GRIFFIN.